It probably makes sense to most people that new construction costs make buying a new home more expensive than buying one that has been used by somebody else. After all, used cars sell for less than new cars and used equipment costs less than new equipment, so it only makes sense that buying brand new homes would cost more than buying resale homes. Different market cycles produce different results for the extra amount you have to pay for new construction. I like to refer to this as the "new construction premium," as you pay a premium for a home not having been owned by somebody else. So by tracking the new construction premium, we should be able to tell whether or not the market is favorable for buying a certain age of home. The real estate graph below was created to help calculate the new construction premium in the Tallahassee real estate market. The black area measures average home values for existing homes (measured in price per square foot on the left vertical axis), while the red area measures the average new home value (also measured on the left vertical axis). The new construction premium each year is shown as a gradient column and measured on the right vertical axis. This premium is the added cost of buying new versus used each year. The best year (going back to 2003) to buy a new home was 2005, when new homes were selling for just 4% more than resales. The worst year on record thus far is this year, where new construction in Tallahassee is selling for 43% more than existing home sales. Why is the premium so high? 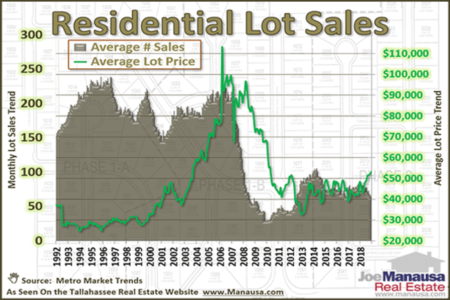 I believe this is because the glut of homes for sale in Tallahassee has made it so homes are not worth as much as they were in the past, while inflation has caused the cost of new construction to continue to move higher. It's not so much that new homes are so expensive (compared to the past), it's that existing homes on the market are so cheap. So what should a buyer do? It's simple. If you have a large enough budget and you've always wanted to buy a brand new home, then go ahead and do it. If you think you want new but are willing to look at existing homes, I strongly encourage you to exhaust the existing homes market before deciding to buy new. The homes are much less expensive and many are sitting on better lots than what you can find for new homes today. Perhaps it would make sense to buy and existing home on a great lot and put some money into upgrades. It is very likely you can do this and still be well below the price of a similar new construction home. This report should give you some thoughts about what you really want and what to expect when you enter the market, but we can help you so much more when we know your specific situation and what you would like to accomplish. 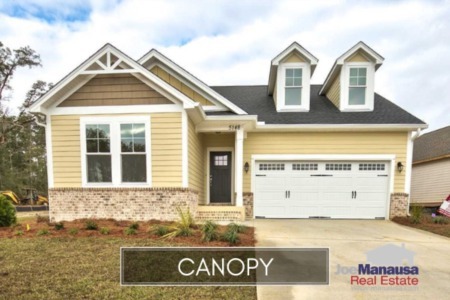 If you would like to know more about Tallahassee's new homes, simply drop me a note and we will be in touch with you shortly. Great information, Joe. In my area of Florida, all too often in established communities, the cost of new construction is location. This will become a major factor down the line when it comes time to sell. Home Not Selling? Frustrated? Try This! © Joe Manausa. All Rights Reserved.